Its not frost tolerant however in full flower Prostanthera magnifica does live up to its name, it is magnificent. It will flower from spring right through summer, and with masses of purple to mauve flowers it puts on a long lasting show. 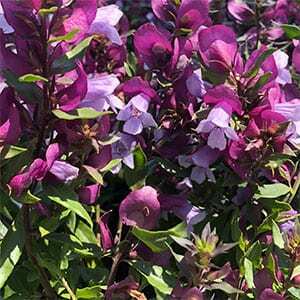 This is a plant from Western Australia and you can buy this either as a grafted plant, which means it will be longer lived, or from seed grown plants which means it will be short lived, however still a great addition to the garden. A well drained soil is essential and a sunny position with a little afternoon shade is best. Ensure good drainage before planting. Common Name – Magnificent Mint Bush. Mint Bush. Position – Part sun or with a little afternoon shade in summer.